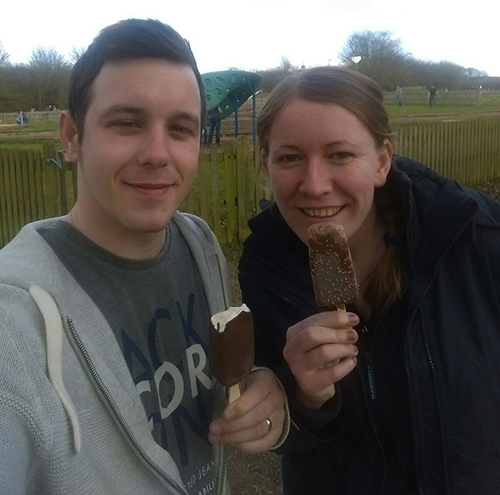 It was gorgeous weather last Friday, the first day of the Easter holidays, so Dan and I decided to head over to a local National Trust park and enjoy our first icecream of 2016. Obviously it’s all about the Feast icecream in Summer. 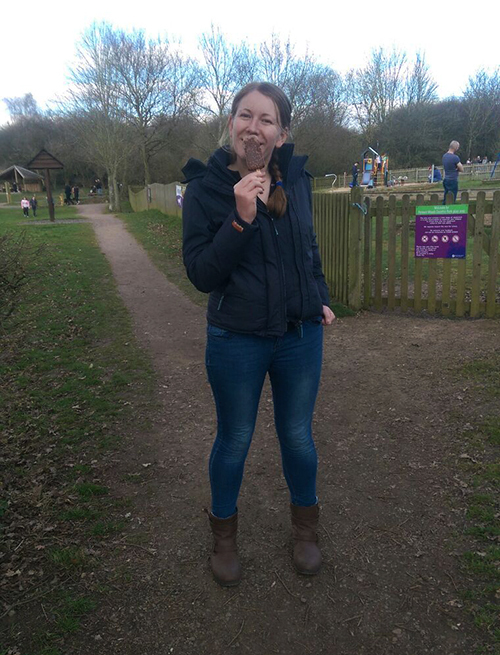 The staff in the cafe were clearly out of practice at serving after a quiet and wet Winter, as despite there only being three people in the queue ahead of us, and three members of staff on, it took nearly 15 minutes to purchase our icecreams(!) so I swapped them just before we bought them as they had begun to melt in the warm cafe queue. After icecream we decided to head out on a wander around the grounds. I wore my boots, but should have swapped to my trail shoes which I’d left in the back of the car as it was still pretty muddy in the wooded areas where the sun hadn’t yet reached. The following morning was parkrun number 48 for me. (Just two to go now!) I decided to head back to Northampton again and run with Laura. With the road works on the A45 having caused me to sprint to the start a few weeks back and then miss the start completely last time I ran the Northampton course, I decided to leave super early at 7:50am. Because this is me, this then meant that the road works ended up not even happening last week and so I arrived super early, although only just early enough to nab the last remaining parking space at the Racecourse venue. Laura’s aim was to beat her time from our last visit to parkrun (33:43), hopefully achieving a sub 33 minute run. We set out at a fairly easy (for me) pace which Laura maintained pretty consistently for the whole 5k. And we still managed to get a bit of a gossip in too! Mile 1: 10:05, Mile 2: 10:11, Mile 3: 10:04, Nubbin (0.16m): 9:41 pace. Laura easily beat her 33 minute target. Obviously a trip to Northampton parkrun with Laura isn’t complete without following it up with a trip to Magee’s, where my regular salted caramel tart came with a piece of honeycomb so large it covered the tart itself! I was still picking at the honeycomb by the time Laura had finished her food and was sipping on the dregs of her hot chocolate! The Magee’s trip was followed up with a long bubble bath whilst watching the Cardiff half marathon on my iPad. What a finish for the guys out on that course. They had it pretty tough towards the end. Sunday, of course, was Easter. Dan presented me with this Galaxy Easter egg whilst still in bed on Sunday morning. 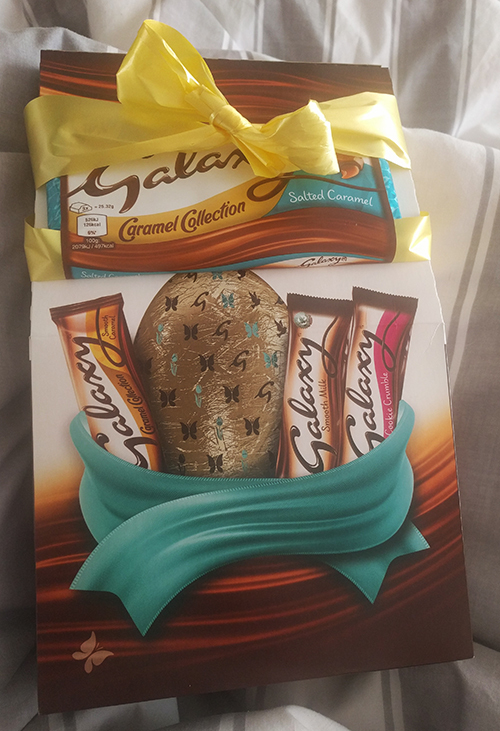 It didn’t come with my favourite salted caramel bar so he wrapped one with ribbon around the top of the egg. I married a goodun! 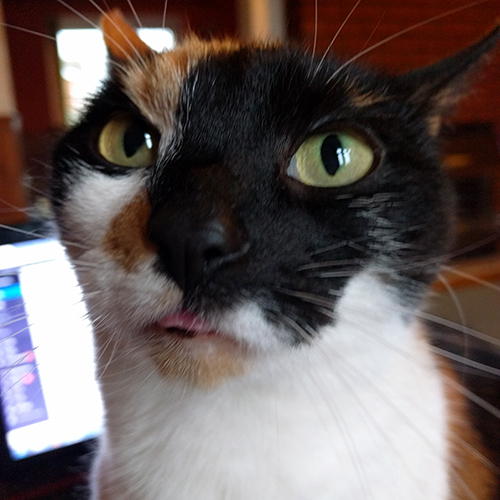 Turns out Bella thought she would like some of my Easter egg and this picture has been making me laugh ever since I took it! With just five weeks before Milton Keynes half marathon, Laura was anxious to prove to herself that she could still run further than the 5k distance, and so we stuck to our tradition of running the Stanwick 10k route an hour and a half before the race on Easter Monday before then cheering the rest of our club out on the course. 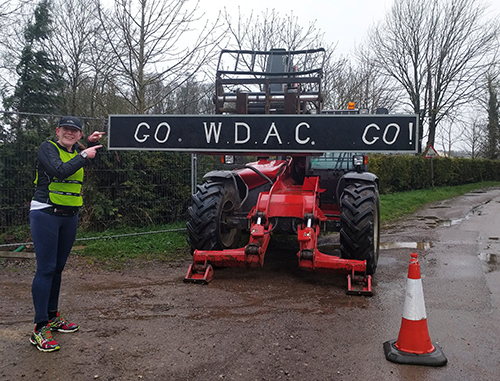 One of our coaches lives on a farm out on the course and every year always puts this sign up outside It’s about 3-4 miles into the course so just as the runners will be needing a little boost. As you can probably see from the photo, it was so wet and windy out on the course on Monday morning. There were parts where it felt like we were actually running backwards because the wind was pushing against us that hard. 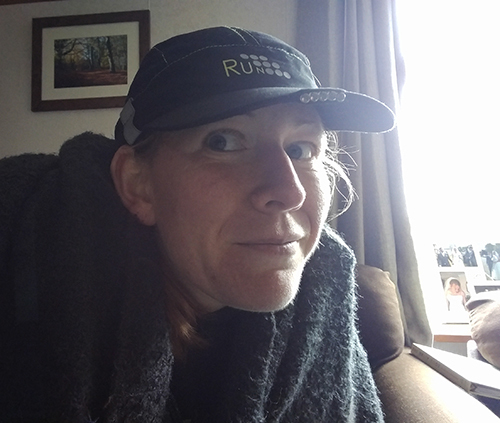 I wore a cap out on the run so that I didn’t get rain in my contacts, but the cap blew off my head completely three times! The wind and rain had kept me up most of the night. I’m such a light sleeper normally anyway, but I could hear bins being overturned outside and the wind and rain hitting the window was so loud that when I woke at 5:25am I didn’t bother even trying to go back to sleep! Laura and I were hi-vised up as part of the 10k route runs along the side of the A6 dual carriageway. It’s all cordoned off with cones along the side of the road and there weren’t very many cars when we ran along at 8:30 in the morning. I wouldn’t want to head that way on a busy day though! Just after we turned off the A6 the wind caught our backs and we had a much quicker mile as we were almost pushed down the rolling hill. I’ve always thought Stanwick 10k was quite hilly, but having run the course for the third year in a row now I’ve changed my mind and think the course could quite suit me with the rolling hills. Perhaps I shall actually race it next year instead…although that would be breaking tradition! 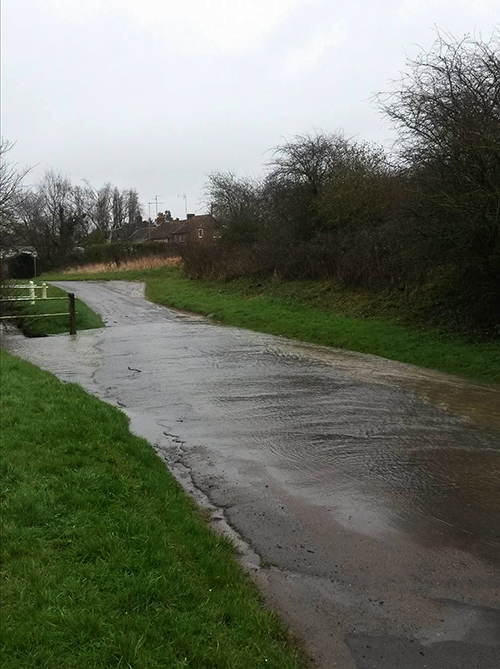 As you enter the village of Chelveston you come to a ford crossing. In previous year, the runners have just run straight through the ford, but after all the rain from the previous evening it was looking rather deep in the middle and Laura and I decided not to chance it so took the wimpy way across the little footbridge instead. It was rather slippy when we headed across though, and it turns out even the front runners headed over the footbridge so I don’t know how muddy and slippery it must have been by the end! We got back in time to quickly change, meet up with a few other Wellingborough supporters, and see the runners off. Our club colours do tend to dominate this race rather, as it is so local to us, but it is Corby who always win the top prizes. After the runners set off, the rain had started up again, so we escaped to the pub over the road for hot drinks and to warm up for half an hour with some other guys from our club before returning back outside to cheer the runners through the finish. As well as lots of runners in the event, we also have lots of cheer support and that final corner can get pretty loud when a green vest is spotted running round the corner! I got a lift home and couldn’t stop shivering as I’d been out so long since my run earlier that morning. I wrapped up in blankets whilst waiting for my bubble bath to run! Did you get any Easter eggs this year? Any runs in the wind and rain? Like I said on Instagram, that tart honestly looks amazing. I’m quite glad that we don’t have somewhere similar at our parkrun as otherwise I’d be stocking up and taking them home with me! 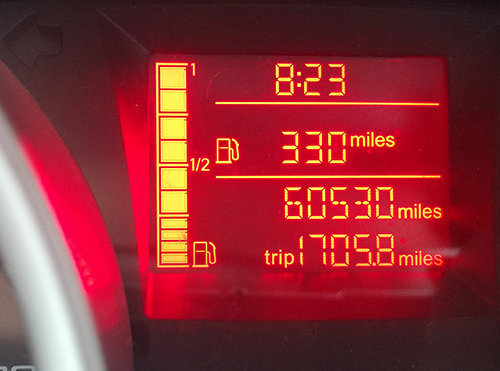 Well done to Laura as well – she’s doing great! Though I did chuckle at you arriving ridiculously early. I leave to set-up parkrun at 7.45am! (Though I guess in fairness I do live a lot closer than you do your parkrun). Well I can confirm the last bit of the Cardiff half was tough! But it wasn’t the worst wind I’ve ever had to deal with (hello Great South Run) thankfully! Cardiff looked ridiculously tough just as the men were finishing so I really admired you lot who still had another half hour or more to go. They missed the worst of it and you got hit instead! 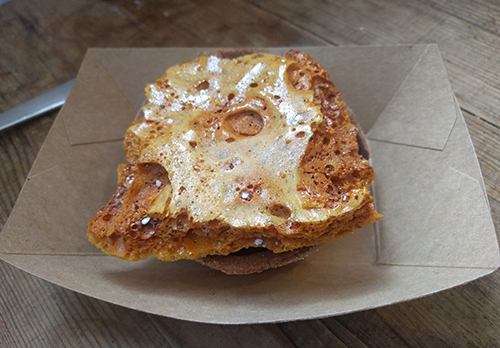 That tart sounds delicious- the honeycomb was huge too! Our parkrun just has a coffee van, so I sometimes get a chai latte for the walk back to the car, but usually I just head home- I think if we had a cafe I would be very tempted each week! Oo so close to 50 parkruns now!! Exciting! 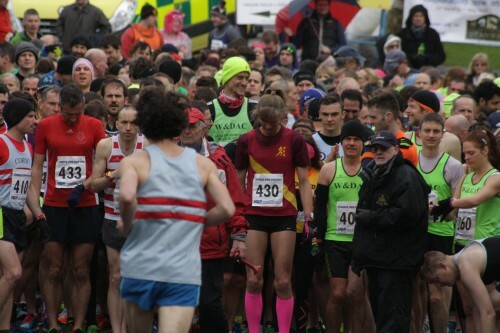 I ran the cardiff worlds, and the elites were lucky they started so far ahead of us (and are much quicker obvs), as we got hit with that weather around 5.5 miles, and it was fairly tough going, but highly entertaining because of how ridiculous it was! There were bits on the TV where rubbish was blowing into the legs of the elites. You could actually see them lose balance when they turned their heads to check runners behind. Massive well done for running in that horrific weather!